We always talk about the exciting fish we see when we are diving or snorkeling or the fantastic day we've had out on the boat or the new beginner divers we've just certified....but none of this is possible without our boat crew - Captain Ded and boat boy X. These guys are an integral part of our great team and work just as hard as anyone keeping all of our customers safe out on the water, helping everyone in and out of the water with their equipment on, serving a great lunch and of course keeping the boat clean and in tip top condition for every trip. Having spent 10 years growing up in Switzerland, Ded also speaks German as well as English! They too have their down time during low season but also have the job of keeping an eye on the maintenance aspects of the boat that are always required. And now we are ramping up to high season, these guys will be working flat out every day taking Midnight Blue out for our divers and snorkelers. Customers often comment about our baby faced Captain but he is old enough to drive - honest!! Both Ded and X are also Chelsea supporters so with an almost all 'true blue' dive team as well, Midnight Blue is the perfect boat for The Dive Academy! On our recent trip to the Maldives around 4.30pm one afternoon the boat crew turned on the huge spotlight on the back of the boat in an attempt to attract Manta Ray's - and it worked!! 3 Manta Rays came to the boat and for around an hour played happily under the spotlight..
We got our equipment on and went for a night dive with the Rays and, as we were told they would, the Manta Rays came in close to the group for lots of interaction. They stayed around for about an hour until we finished our dive. After the dive we had dinner on the boat and we could see that the Manta’s were still playing around at the back of the boat, attracted by the spotlight. A couple of hours after our previous dive me and one other diver from the group decided to make another dive and this time we were lucky enough to have 4 Manta Rays to ourselves. We sat on the floor and just waited for the rays to come to us and they didn’t disappoint as they played around us for the next hour and a quarter, sometimes bumping into us as they glided past. With spans of up to 5 metres the Manta’s completely blocked out the light from the boat as they swam over us within inches of our regulator, so close that we felt we had to duck at times to avoid them bumping in to us. Apologies for the poor quality of the video but one of the reasons the ray's stayed around for so long was because of the particles in the water so please forget the quality and enjoy the Manta Rays as much as we did. We had beautiful weather yesterday and two great dives at Sail Rock. Viz was also good at 15-20m and we saw Giant moray eels, white eyed moray eels Pipefish, Trevally, Barracuda Fusiliers, Shrimp, Crabs, Beaked coralfish and Batfish. Today we headed to Koh Tao and although the weather wasn't quite as nice as yesterday the diving was great! Our first dive was at Twins, viz was good at 15m and we spotted a few Blue spotted stingrays Yellow boxfish, Parrot fish, Rabbit fish and Saddleback anemonefish. After a break for lunch and a heavy shower we went on to White Rock. Viz was similar to Twins at around 15m and again there was plenty to see including- Angelfish Filefish, Great baracudda and lots of Triggerfish! 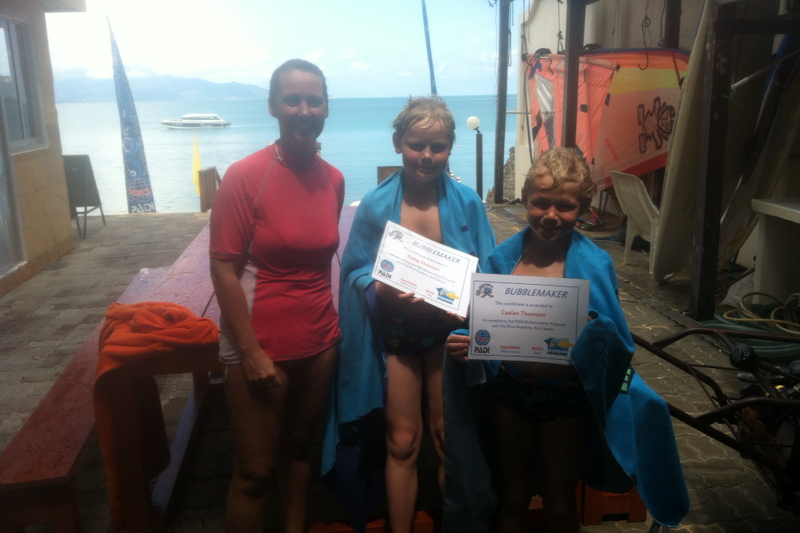 Well done to all our divers today and a big congratulations to Haroldo who completed his Open Water Course!!! Another lovely sunny day as we journeyed to dive Koh Tao today. Our first stop was at Twins, viz was ok at 8-10m but still lots to see! including- Angelfish, Blue spotted stingrays, Boxfish and Trigger fish. After a delicious lunch we headed to White Rock for our second dive of the day. Viz was still 8-10m and we saw, more Angelfish, Parrot fish, Bannerfish and another Bluespotted stingray! Well done to everyone today and a big congratulations to Katie, Alex, Daniel and Carolina on completing Discover Scuba Diving!!! Keep blowing bubbles guys!! 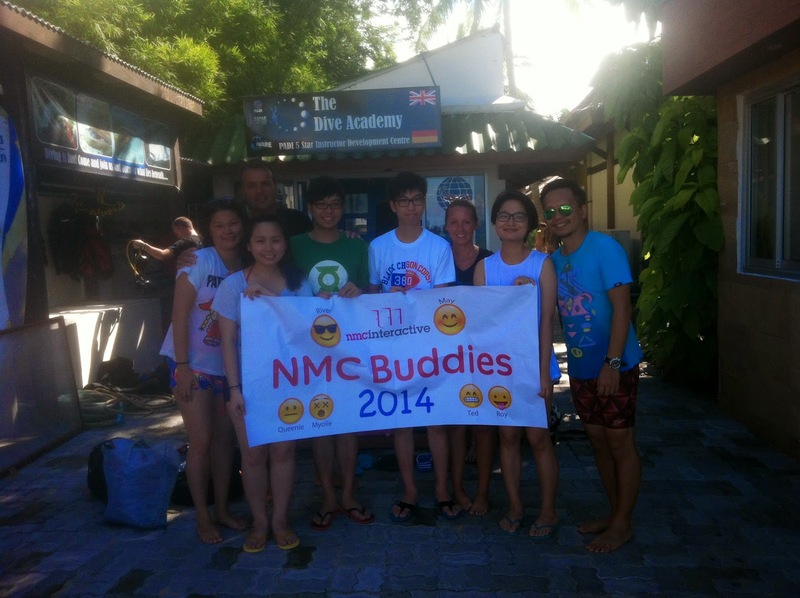 We've had a great time today diving Chumphon Pinnacle and Laem Thian! Viz at Chumphon was 10-15m with a little bit of a current, but nothing our divers couldn't manage and plenty of marine life to see! We saw schools of Fusilier and Great Barracuda, Giant Grouper, Pink anemonefish and Lionfish. 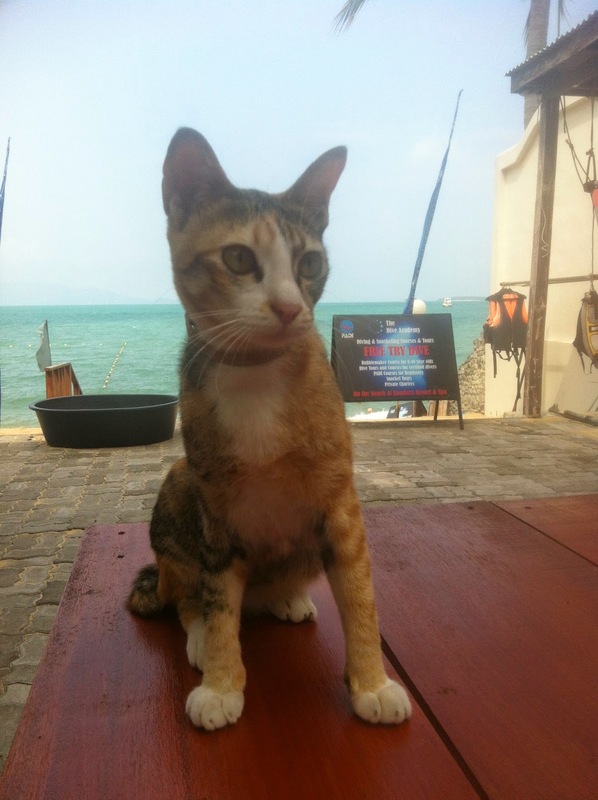 After a break for lunch we journeyed back to Koh Tao to dive Laem Thian. Viz had dropped slightly to 8m but there was still lots to see including Harlequin Sweetlips, Angelfish, Butterflyfish, Queenfish and Blue spotted stingrays. Well done to everyone today, we hope you enjoyed the trip and you enjoy the rest of your holiday! 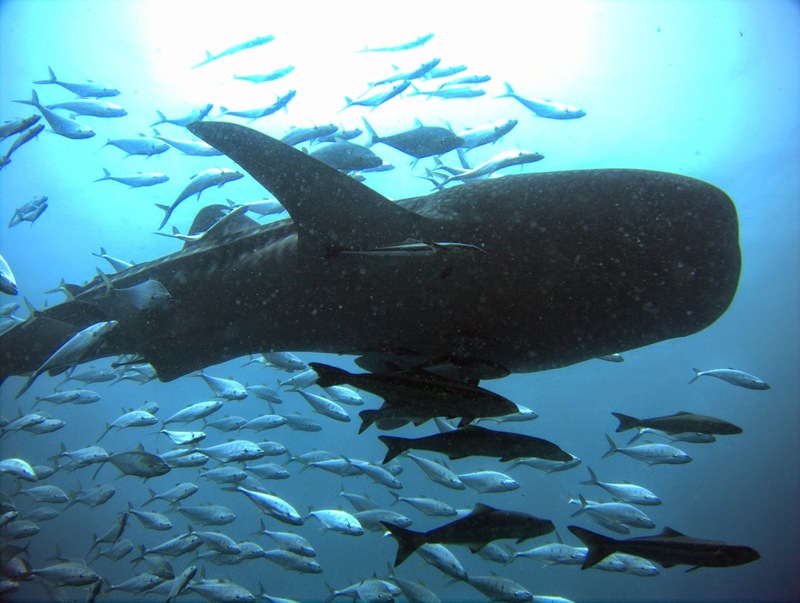 Its been a rainy day on Koh Samui but we've had another great trip to Sail Rock and two exciting dives! Although the weather was a little changeable the sea was flat and viz was good at 15m. There was lots to see today including- Box fish, Angel fish, Harlequin sweetlips, Grouper, Porcupine fish, yellow tail barracuda, Fusilier and a white eyed moray eel and a lot more! Well done to all our divers today we hope you enjoyed the day as much as we did! A beautiful day and two great dives at Sail Rock! Viz was good at 10-15m and there was plenty to see as always... including schools of Barracuda, Butterflyfish, Bannerfish, Becked coral fish and Titan triggerfish. 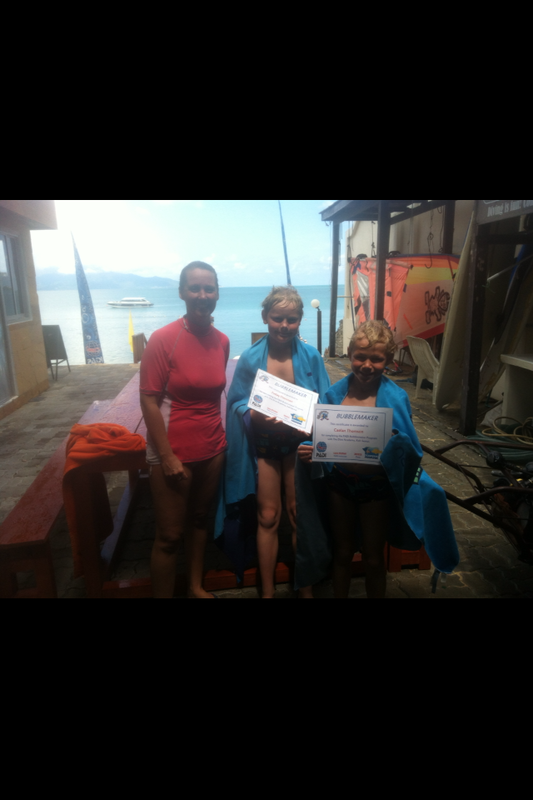 Well done to Natalie and Tahiia who completed Discover Scuba diving!! Congrats guys!! 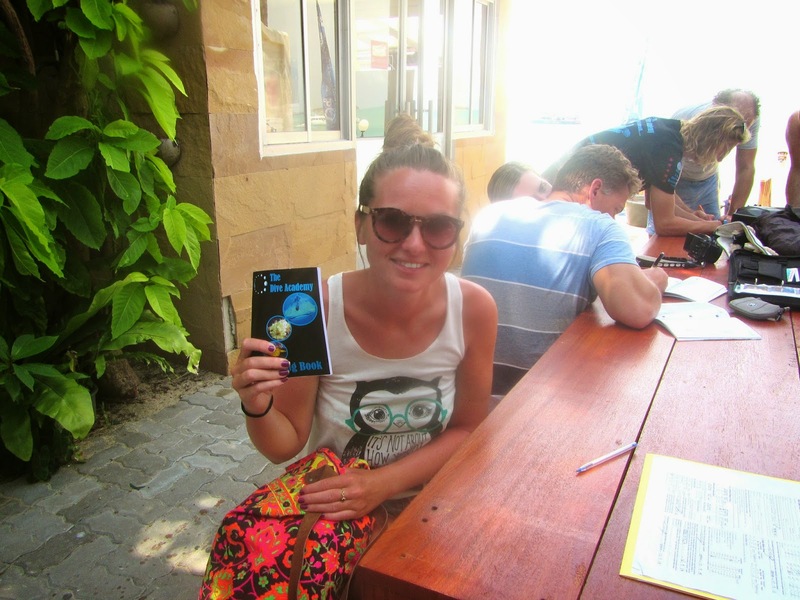 Although this month has been fairly quiet on Koh Samui, The Dive Academy has been anything but! We have had lots of people take their first exciting breaths under water this month with Discover Scuba Diving, a fair few PADI Courses including- Bubble Maker, Open Water courses, an EFR and Rescue course and plenty of happy Fun Divers and snorkelers exploring the magical underwater world around Koh Tao and Sail Rock. The weather this month has been a little unsettled with some pretty impressive thunder storms! However the rain doesn’t last forever and the diving conditions have still been excellent with viz on average ranging from 10m-15m..… and lots to see! Some of what we spotted this month were Butterflyfish, Bannerfish, Giant grouper, Titan triggerfish, White eyed moray eels, Porcupinefish, Squirrelfish, Christmas tree worms, Blue spotted stingrays and Black tip reef sharks! We met a lovely group recently on a team building event, River and May were certified divers but Quennie, Ted, Roy and Myolie tried diving for the first time! We started off in the swimming pool with a ‘Try Dive’ and they all loved it! So the following day they all ventured out on their team building exercise and completed their Discover Scuba Diving!! Well done guys!! 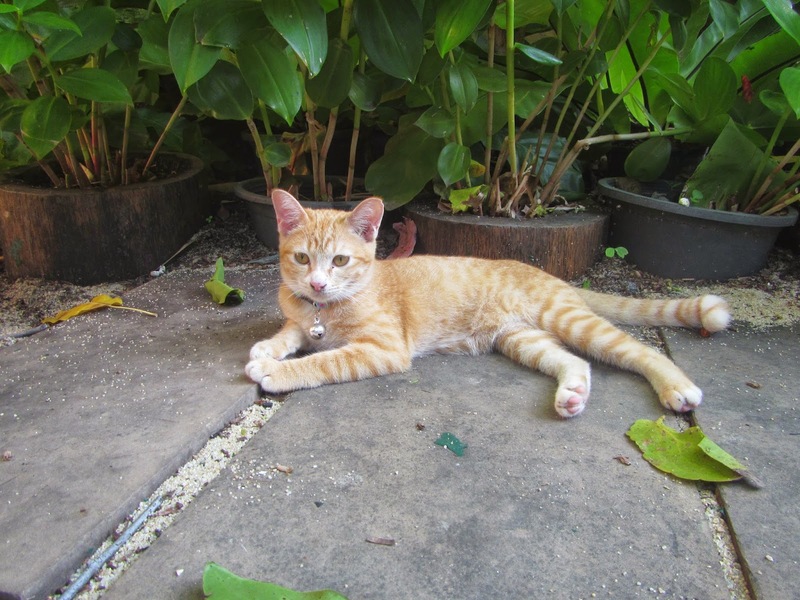 Our new addition to The Dive Academy family, little‘Ginger Ninja’ has settled in well and loves her fancy new collar! 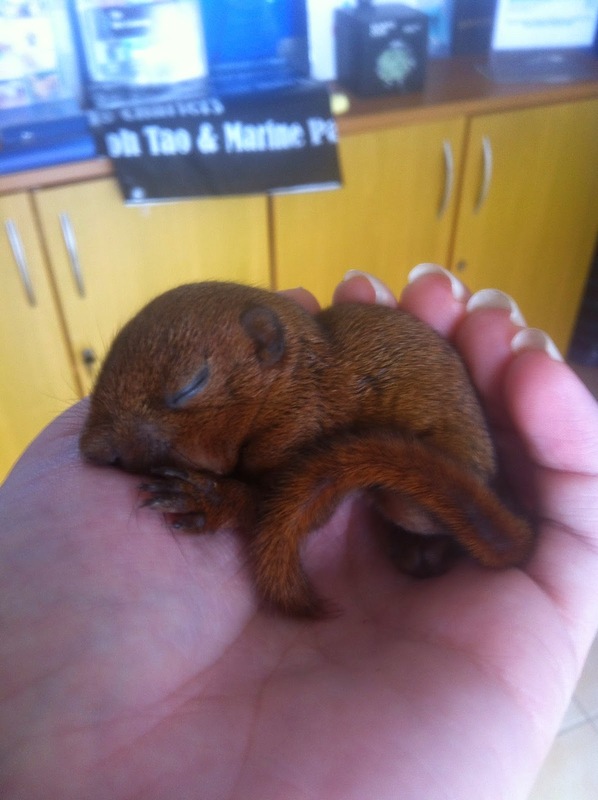 We almost had a new pet squirrel! We think he must have fallen from a tree and Stumpy the cat gently picked him up and bought him to me… luckily he wasn't hurt and after a bit of a cuddle I noticed his mum sat in the tree, I placed him onto the tree trunk and mum came down to collect him!! We recently had a fantastic day of diving, snorkeling and general frivolity around Koh Tao with three lovely families. The weather was sunny and bright and the journey to Koh Tao was smooth and easy. We did have a 5 minute rainy spell on the way over to Koh Tao, which at the end resulted in a beautiful rainbow. We did our first dive at Twins where three of the children tried diving for the first time taking Discover Scuba Diving with Claire while Paul took one of the children and two of the grown up’s for a leisurely fundive. John also had his hands full taking the rest of the group snorkeling in the shallows around the lovely Koh Nangyuan. After the dive we headed to Japanese Garden for lunch where the children had a great time playing games and jumping and summersaulting off the boat… which was very impressive! The adults took the opportunity to relax and enjoy the sunshine!! Second dive we went to Shark Island for a bit more diving and snorkeling and fortunately the snorkelers saw just as much as the divers – and everybody underwater managed to see loads of fantastic marine life!! On the way back it stayed lovely and dry and the warm ocean breeze made everyone a little sleepy, especially after the day’s fun and games! Even mum had a bit of a snooze. Another great day out on Midnight Blue and everybody had a great time. Why don't you come and join us for some fun too! September was another great and exciting month of diving and Snorkeling with The Dive Academy with almost daily trips going out to Koh Tao or Sail Rock. The marine life has once again been outstanding, with plenty of sightings of Beaked coralfish, Harlequin sweetlips, Bluespotted stingrays, Hawksbill turtles, Giant moray eels, yellow boxfish and to top it off Whale sharks!! September was also a very busy month for our PADI courses which has certainly kept our instructors busy! 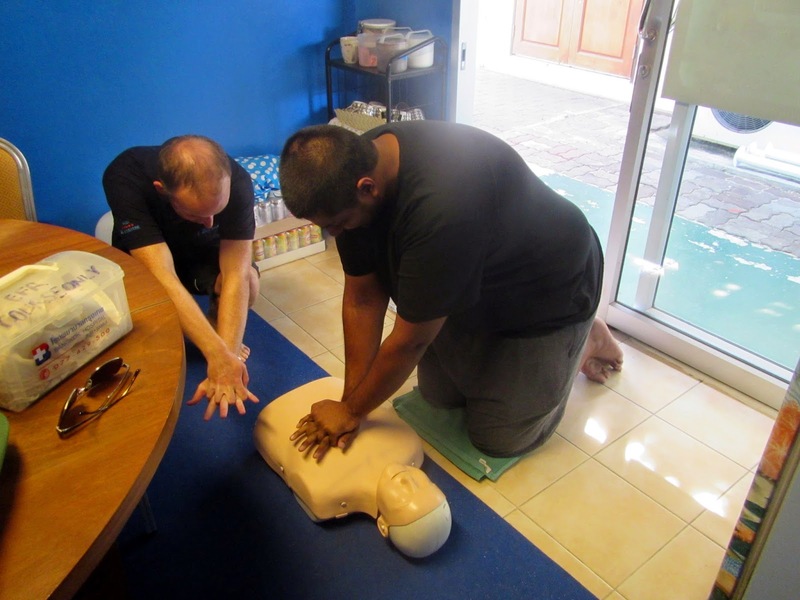 With PADI Scuba Divers, lots of Open Water students, a rescue and EFR course and with Camille running an IDC, we have nearly had the full range of PADI courses run in just one month! A big congratulations to everyone who has completed a course this month, it was great to have you here! And remember keep blowing those bubbles!! In other news- our driver Noi has built us a fantastic new table for our customers to relax in the afternoon sun while logging their dives and admiring the view over to Koh Phangan. We have also had a new Dunk Tank built for washing the equipment which is not only practical it also smartens the place up. 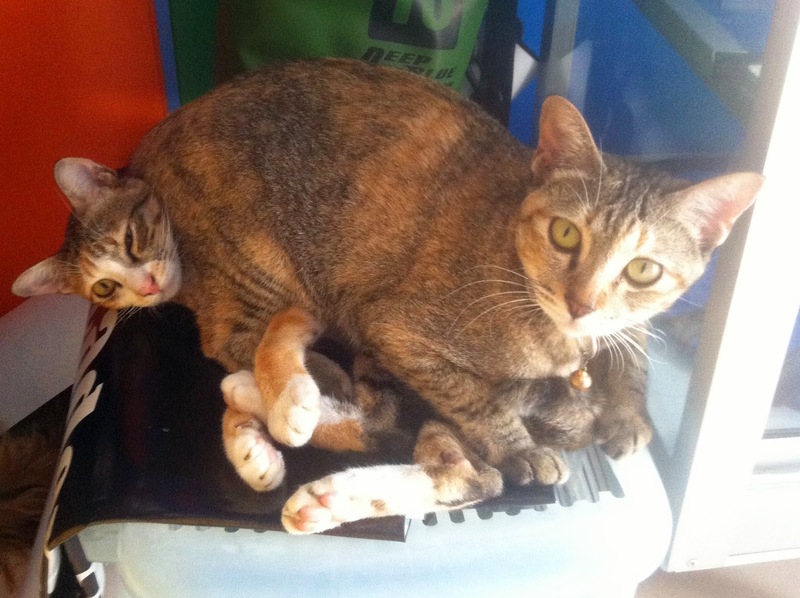 One of our cats, Curly Sue has been a bit under the weather with an infection in her leg… but after a course of antibiotics, lots of love and cuddles and lots of attention from her sister Stumpy, you’ll be pleased to hear she is back to her normal self. 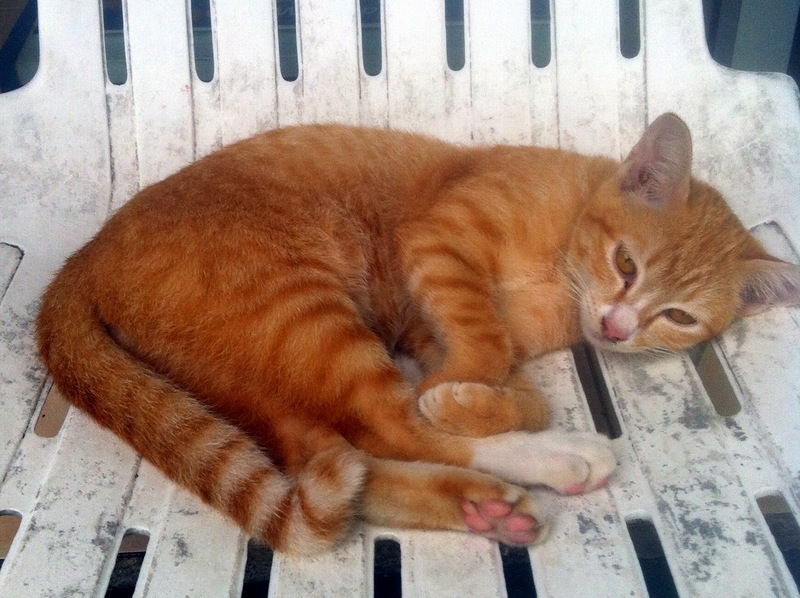 And their younger step sister "Ginge" is now hanging out at the dive centre with her sisters so we've got the whole family now! !